On dating apps like Tinder or websites like OKCupid, the two most common aspirations listed on personal profiles are Netflix binge watching and traveling. Similarly, time spent backpacking in Europe is a recommended spiritual goal for the college graduate. Traveling to beautiful and famous places to acquire experiences is a “scientific” way we promise ourselves happiness. Wanderlust is an ideal. But it’s nothing new. Nor is it meaningful. During the 17th-19th centuries, wanderlust masqueraded as a rite of passage called “the Grand Tour.” The idea was that exposure to famous, beautiful, and cultured places throughout Europe would through a kind of osmosis transfer meaning, culture, in a word, character to visitors. This idea still lingers. It’s the pull behind every advertisement in buses, trains and subways urging you to end your sadness, find beauty, and become someone new—anywhere but the people and places you call home. The Grand Tour had its contemporary critics, my favorite one being Ralph Waldo Emerson, who himself was inspired by the Stoic philosophers criticizing wanderlust in the first 200 years after the Death of Christ. People have been traveling for questionable reasons for a very long time. Any reader of Emerson’s most famous essay, “Self-Reliance” (1841), will notice that he spends a large portion of the lectures conclusion attacking wanderlust: that is, the desire to travel for the sake of traveling, as if it were a desirable goal in itself. Though it was a controversial opinion in his own day, and still is, Emerson was critical of traveling as an ideal. Both Emerson and the Stoics argued that wanderlust is an empty ideal that can make our lives less meaningful and disconnect us from those around us. Rather than seeking the world’s wonders through travel, they said, we should learn how to cultivate our capacity to wonder at home. We should live at home like travelers, discovering in our relationships and immediate surroundings the keys to a life well lived. Traveling may be beneficial, but only when our duties, families, and friends call us forth, or if traveling will improve our character in a way that staying at home could not. Good travelers create a home everywhere, and they seek virtue and wisdom wherever they are. I am not much of an advocate for traveling, and I observe that men run away to other countries because they are not good in their own, and run back to their own because they pass for nothing in the new places. For the most part, only the light characters travel. Who are you that you have no task to keep you at home? I have been quoted as saying captious things about travel; but I mean to do justice. I think there is a restlessness in our people which argues want of character. Emerson is skeptical about wanderlust because he suspects that often, but not always, habitual wanderlust is inspired by a frustration with our own surroundings, duties, and tasks, a frustration which more often than not is our own fault, a vice of our character. As Emerson put it when he first began to criticize wanderlust, “It is for want of self-culture that the superstition of Traveling, whose idols are Italy, England, Egypt, retains its fascination for all educated Americans.” Emerson suspects we often mistakenly imagine the source of our problems resides in the people and place we call home, rather than ourselves. Yet, though Emerson’s criticizes wanderlust, he is not categorically opposed to traveling; there are bad and good reasons to travel. Travel can be done well. It can be done poorly. It is good to travel if you do it to improve your character, or if traveling supports relationships at home which cultivate your character. Conversely, it is bad to travel for any other reasons. If we travel because we are sad, disappointed, or frustrated, we will still carry our sad, disappointed, and frustrated self wherever we go. I have no churlish objection to the circumnavigation of the globe, for the purposes of art, of study, and benevolence, so that the man is first domesticated, or does not go abroad with the hopes of finding somewhat greater than he knows. He who travels to be amused, or to get somewhat which he does not carry, travels away from himself, and grows old even in youth among old things. In Thebes, in Palmyra, his will and mind have become old and dilapidated as they. He carries ruins to ruins. Traveling is a fools paradise. Our first journeys discover us to the indifference of places. At home I dream that at Naples, at Rome, I can be intoxicated with beauty, and lose my sadness. I pack my trunk, embrace my friends, embark on the sea, and at last wake up in Naples, and there beside me is the stern fact, the sad self, unrelenting, identical, that I fled from. Wherever we go we carry our character with us. So, rather than seek beautiful places we should learn to find beauty within our character, and sculpt our character into something more beautiful. If we learn to “improve” who we are through “self culture”, as Emerson puts it in “Self-Reliance”, we could become as “brave” and “grand” as the famous sculptures of the ancient Greek sculptor Phidias. We would not need to seek beauty abroad, because we could reveal the beauty wherever we are. Do you think that you are the only one this has happened to? 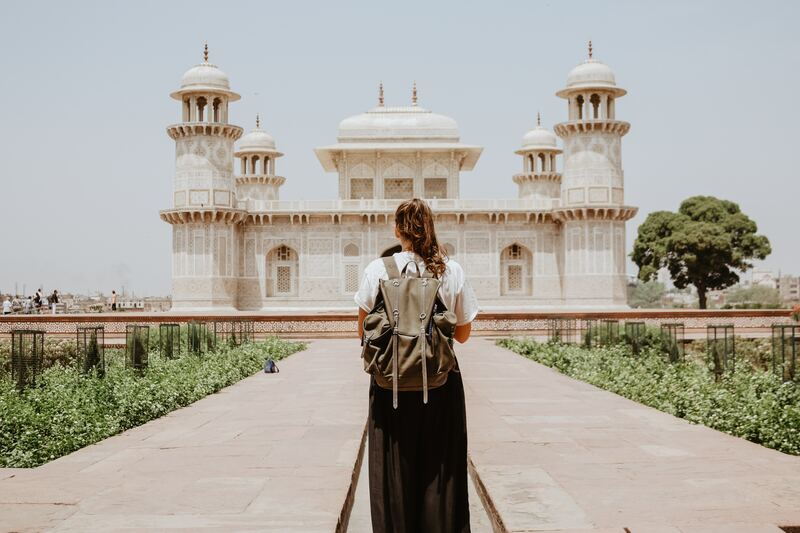 Are you amazed to find that even with such extensive travel, to so many varied locales, you have not managed to shake off gloom and heaviness from your mind? As if that were a new experience! You must change the mind, not the venue. Though you cross the sea, though ‘lands and cities drop away,’ as our poet Virgil says, still your faults follow you wherever you go. Here is what Socrates said to a person who had the same complaint as you: ‘Why are you surprised that traveling does you no good, when you travel in your own company? The thing that weighs on your mind is the same as drove you from home.’ What good will new countries do you? What use is touring cities and sites? All your dashing about is useless in the end. Do you ask why your flight is of no avail? You take yourself along. Seneca suggests that the cure to sadness is a change of character, not a change of air. Seneca’s warnings match Emerson’s warnings that we should not travel to cure sadness—and the reason is simple. Emerson read Seneca cover-to-cover, as well as the two other major Stoic philosophers, Epictetus and Marcus Aurelius. In his lecture, “Books,” Emerson went so far as to claim these three Stoic philosophers wrote “the Best classes of Books” as well as the “Bibles of the World.” Furthermore, as Robert D. Richardson has argued, Emerson was frank about his admiration for Stoicism, openly considered himself a Stoic, and saw transcendentalism in general—and his famous ideal of Self-Reliance in particular—as Stoicism “cast into the mould [sic] of these new times.” Seneca, Epictetus, and Marcus Aurelius are the Stoic roots of Emerson’s criticism of wanderlust. Like Emerson, Epictetus observes how his contemporaries are willing to go on expensive, difficult, and tedious journeys to see beauty, but have no equally powerful desire to perceive the beauty around them. Rather than seek beauty elsewhere, Epictetus urges that we should learn to sculpt our character into something virtuous. Epictetus offers as an example Phidias’s famous statue of Zeus as a model for our self cultivation. Emerson’s rhetorical debts to Epictetus are unmistakable. People try to get away from it all-to the country, to the beach, to the mountains. You always wish you could too. Which is idiotic, you can get away from it anytime you like. By going within. Nowhere can you go is more peaceful – more free of interruptions – than your own soul. Especially if you have other things to rely on. An instant’s recollection and there it is: complete tranquility. And by tranquility I mean a kind of harmony. So keep getting away from it all-like that. Renew yourself. There is no question Stoic philosophy animates Emerson’s criticism of wanderlust throughout “Self-Reliance”, “Art” and “Culture”. But again, neither Emerson nor the Stoics are categorically opposed to traveling, just wanderlust. Wanderlust is a vice, not a virtue. It encourages us to locate the sources of all our problems in the people and places we call home. This prevents us from being at home anywhere, because it locates home wherever we aren’t. We desire to wander, Emerson suggests, in order to learn from others how to be at home. In “Self-Reliance”, he notes, “They who made England, Italy, or Greece venerable in the imagination did so by sticking fast where they were, like an axis of the earth.” Why else do half a million people visit Walden Pond each year? By “sticking fast” to their Walden Ponds “like an axis of the earth” people like Thoreau make places meaningful. Emerson and the Stoics remind us we can do the same. They challenge us to live at home like travelers. We can find beauty, wonder, and happiness in the people and places of our everyday lives—if we try. This essay has also been published in Front Porch Republic. Christopher is a writer. He is interested in the legacy of Greco-Roman and Classical Chinese philosophy, in particular, how Ralph Waldo Emerson combined Stoicism and Confucianism to create his philosophy of Self-Reliance—with which he supported the abolitionist and women’s rights movements. When in doubt Chris, usually opens up a copy of the Confucian Analects or Marcus Aurelius’s Meditations for guidance. Christopher is a writer. He is interested in the legacy of Greco-Roman and Classical Chinese philosophy, in particular, how Ralph Waldo Emerson combined Stoicism and Confucianism to create his philosophy of Self-Reliance—with which he supported the abolitionist and women’s rights movements. When in doubt Chris, usually opens up a copy of the Confucian Analects or Marcus Aurelius’s Meditations for guidance.